The “first date” that Steve and I went on where we ate an actual meal was breakfast. He ordered French toast. And sausage. And orange juice. He thinks I forget everything. This is only partially true. I figured he would like some French toast for breakfast the other morning, so I made him some with blueberry vanilla sauce. I told him I was making him “breakfast”, used as a general term, and his first reaction was that he thought he was getting a hash that I make every once in a while. Side note: That boy likes his meat and potatoes. This plate had none of that. He said the blueberry sauce wasn’t his thing and he didn’t like the (what I thought know was very slight) lemon flavor, but that I did a good job on the French toast. I guess that was a compliment. One thing I can always count on is Steve being honest about food. If he doesn’t like it, I know. This means when I get a compliment it means a little bit more. 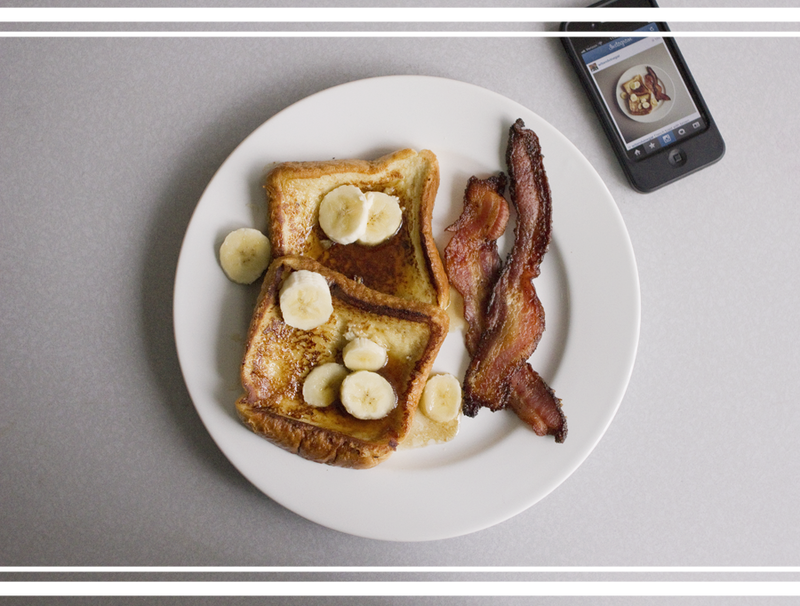 French toast – yes, as long as there’s some form of meat on the plate. Blueberry Sauce – no. He claims it was the lemon but I feel there’s an underlying hatred for cooked whole berries. That’s the Miss Cleo in me. I made him that second plate up there with peppered bacon and a brown butter syrup that kind of tastes like toffee. Aaaand I included a mimosa. He ate everything, but informed me that he likes powdered sugar on his French toast. French toast with not blueberry sauce, some meat, and of course, powdered sugar. Combine everything (minus vanilla) in a small saucepan, bring to a simmer, and simmer away for 15 minutes until slightly thickened and the berries have broken down. Add vanilla. Combine sugar and water in saucepan, bring to simmer, simmer for 20 minutes until slightly thickened and pour into a measuring cup or some sort of serving container. Put the butter in that empty saucepan and melt, continue to cook until it gets sliigthtly browned. Pour into the syrup with the vanilla. Just melted butter, if you aren’t confortable with browning it. Booze – a couple T of Malibu at the end would be amazing. 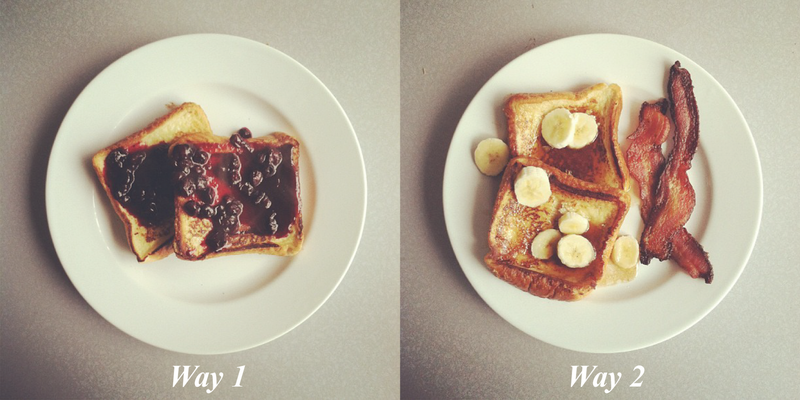 Now let’s move onto the French toast. several slices of that thick cut texas toast, or some leftover French bread that you didn’t use for garlic bread. Whip out a pie dish, it’s the best for French toast dippage. Beat the eggs in there, then add the rest of the ingredients. Take a small pat of butter and melt it in a large frying pan. I like to quickly dip the bread if it’s fresh, but I’ll go slower if it’s a couple days old. Place it in pan, and cook until lightly browned on either side. Maple syrup has this sort of smoky caramely quality to it. It doesn’t actually taste like the stuff the bottle claims is maple syrup. So I believe this totally customizable syrup base is perfect if you don’t feel like driving to the store at 9am in the morning or spending $10 on a bottle of syrup. Also real maple syrup is much thinner than the stick to your ribs artificial stuff. @AJ apparently I wasn’t in the know!